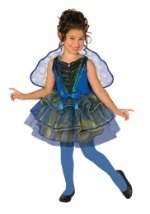 They'll be the prettiest bird in the park when they go in this adorable Precious Baby Peacock Costume! 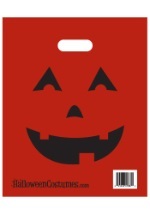 It includes a jumpsuit, tail, hood, and booties. The blue jumpsuit is 100% polyester and has a soft, furry feel on the outside, and a comfortable lining inside. The back zips up, and at the bottom all along the legs are snap buttons making on and off a breeze. The bird foot shaped booties are bright yellow and very soft. The hood fastens with Velcro™ under the chin and has elastic around the face opening for the perfect fit. The top has green tassels and a plush beak. Last but not least is the big colorful and plush fan tail. Colors are screenprinted on the tail to look like feathers, and all around the edge is blue faux fur. This tail snaps easily to the back of the jumpsuit. 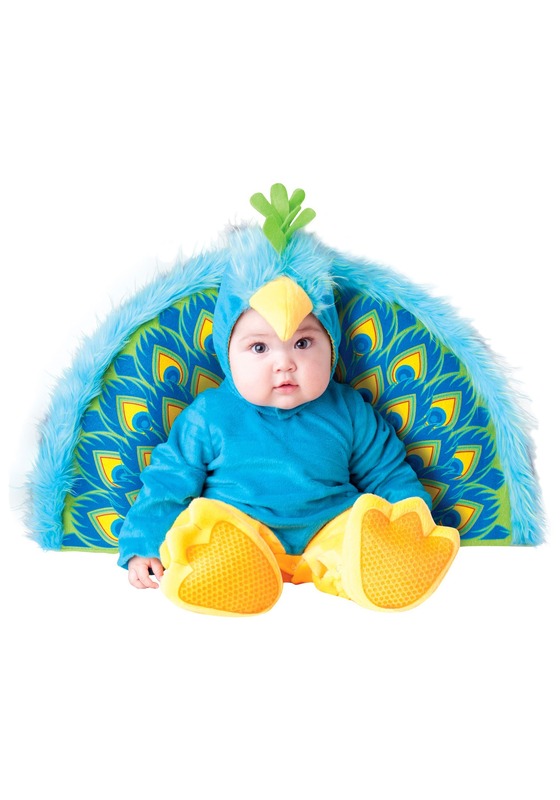 They'll strut their stuff all Halloween long when they wear this proud peacock costume for babies!